Questions of how the U.S. got mired in the Vietnam War and whether it was ultimately winnable have fascinated historians for half a century – most recently in Ken Burns’ new 18-hour documentary. A little-remembered aspect of the debacle is the important role played by a prominent economic historian named Walt Whitman Rostow, whose theories on economic development helped persuade Americans – and two presidents – that the fight in Vietnam was right and that we must prevail. The Burns documentary, from what I have seen, does not dwell much on economics, my area of expertise. But this was an important part of why Americans were there. Rostow came to prominence in the 1960s after his theories on economic development caught the eye of the Democratic Party and John F. Kennedy, who was campaigning for president. In 1960, Rostow, then a professor at MIT, published an influential book called “The Stages of Economic Growth: A Non-Communist Manifesto.” The book describes how an economy transitions through five distinct stages of development, from basic (little use of technology, like much of central Africa and South Asia in the mid 20th century) to advanced (characterized by high levels of mass consumption, such as the U.S. or France). Rostow believed economic development was a universal process that would generally occur in all countries albeit with unique national characteristics – that is, except under communism, where he believed the process would be much inhibited. He described communism as a “cancer” of economic development. Communism, therefore, had to be forcefully resisted to protect a given country’s economic prosperity and freedoms and, ultimately, American national security and well-being as well. 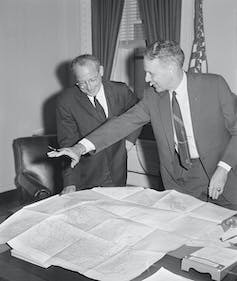 Rostow’s view that economic development could be used to resist the spread of communism attracted Kennedy, who brought the professor to the White House as an adviser on national security. Throughout his time in government, Rostow was one of both Kennedy’s and then Lyndon B. Johnson’s most hawkish advisers. From the start he urged a prominent American role in Vietnam to thwart the spread of communism, and he remained steadfast even as others, such as Secretary of Defense Robert McNamara, increasingly saw the war as unwinnable. 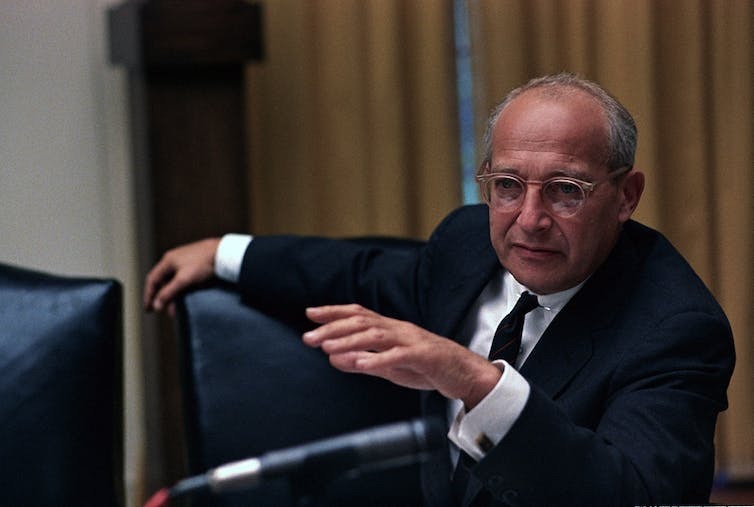 Rostow, who left the White House in 1969 after serving three years as national security adviser, viewed the American loss in Vietnam as a military failure rather than one of political judgment. Even many years after the war, he believed the U.S. could have prevailed in South Vietnam with just a little more determination. 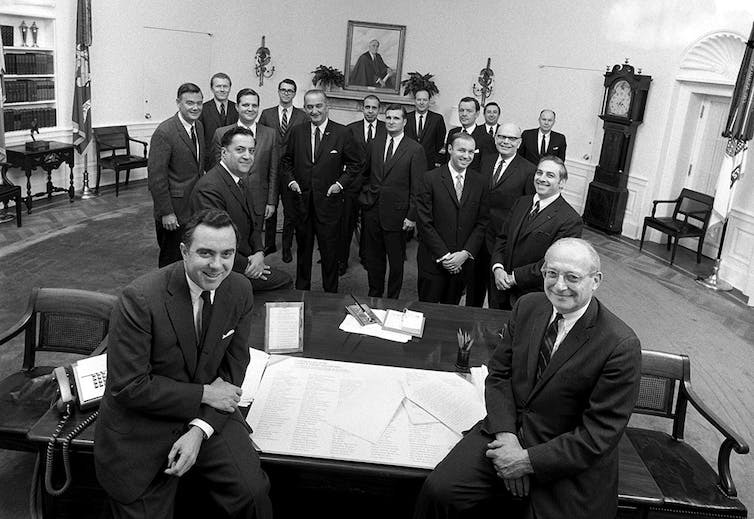 President Lyndon Johnson poses with members of his staff, including Walt Rostow, front right, during his final weeks in office in 1969. I met Rostow some years after the war, in the early 1980s, when he was one of my dissertation advisers at the University of Texas at Austin. We’d sometimes discuss the war and his economic theories. Rostow believed that communism meant unyielding one-party control of key pillars of an economy, which would surely stifle freedom and prosperity. It would also impede transitioning to more advanced stages of development. He argued faster growth would help stave off the threat, which is why he ensured economic aid was part of the White House strategy to win the war. When I knew him, the rise of Asia’s communist countries including China and Vietnam had not yet occurred, and he saw little evidence that would have refuted his beliefs about communism and the “Stages of Growth.” Their economies didn’t begin their sharp rise until China led the way in the mid- to late 1980s. He assured me, however, that South Vietnam would have prospered much earlier had communism been successfully repelled, just as South Korea began to flourish after its war. Perhaps, but the recent success of Asia’s communist economies does show that one-party rule can succeed in bringing about prosperity, at least more than we once thought. And as a result, the global economy’s center of gravity is shifting toward Asia. In the end, however, Walt Rostow was unrepentant. Rostow was of the generation that boasted its willingness to “pay any price, bear any burden, meet any hardship” in the defense of liberty. And he was one of those who really believed it. This always struck me as peculiar not simply because it is extreme, but because economists are trained to think in terms of optimization or balance, not maximization at the extreme. His “Stages of Economic Growth” is not widely studied in the United States these days, although some of the terms he coined, such as economic takeoff, are still used to refer to the rapid and catalyzing acceleration of economic growth. American economists today tend to avoid such grandiose socioeconomic theories, preferring instead to appreciate the complexity of forces at work in economic development and pursue more rigorous mathematical methodology. To me, a significant problem with “Stages” was the subtitle, which I took issue with in a paper I wrote in 1993 on South African economic development. Particularly in light of the success of countries like China and later Vietnam, “A Non-Communist Manifesto” became ideological dead weight, inseparable from the economic theories he forged supported by data. Despite its weaknesses, “Stages of Growth” had strengths, such as its multidisciplinary nature and embrace of technology, which is what really drives development in the long run. Unfortunately, the weight of his focus on communism ultimately was too much of a liability and undermined its legitimacy. This is true in politics more broadly as well as health care (my specialty), where ideologically driven special interests polarize and paralyze. Rostow, who died in 2003, would have been better served without the ideological baggage. And this goes for the rest of us. We all too often fail to come together for pragmatic ends because of ideological conflict. Peter Hilsenrath, Joseph M. Long Chair in Healthcare Management & Professor of Economics at the University of the Pacific. This article was originally published in The Conversation.